Investigators in this project include researchers from NOAA ESRL Chemical Sciences Division, Global Monitoring Division, University of Colorado, and University of Michigan. The United States has recently experienced an energy revolution, becoming the number one global producer of oil and gas. This transformation has largely been driven by the ability to access vast, previously inaccessible reservoirs with high-volume hydraulic fracturing. Recent studies have indicated that some regions of fossil fuel harvesting are emitting greater quantities of methane than previously accounted for. These studies have focused on gas production basins. However, hydraulic fracturing has also revolutionized oil production, and the direct atmospheric and climate impact of rapidly expanding oil production remain unknown. 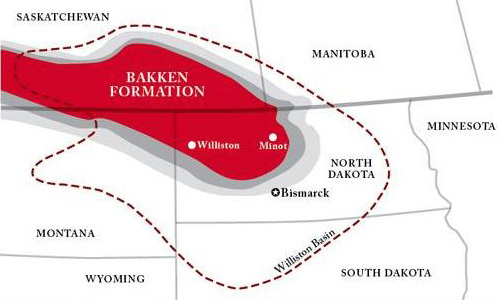 The TOPDOWN study aims to understand the atmospheric impact of rapidly expanding oil and gas operations in the Bakken play in North Dakota. (Subsequent flights will also examine the Denver-Julesburg basin in NE Colorado, and the San Juan basin in New Mexico.) Measurements of key atmospheric trace gases (CO2, CO, CH4, C2H6, O3, and many more) along with black carbon will be made from the NOAA Twin Otter in the Spring of 2014. The overarching goal of TOPDOWN is to quantify methane emissions from the Bakken. The primary flight method used will be a mass balance approach - flying multiple downwind cross-sections of the active field to quantify the enhancement and infer an emissions rate. On low-wind days, raster flights will be made to characterize the spatial heterogeneity of the field combined with the varied source alkane and isotope characteristic. Individual characterization of large gas plants and other large point sources will also be performed, potentially including active fracking operations.